If you haven’t read the book “Black hawk Down” and you’re in any way shape or form a military buff, you need to get out and read that book Pronto! 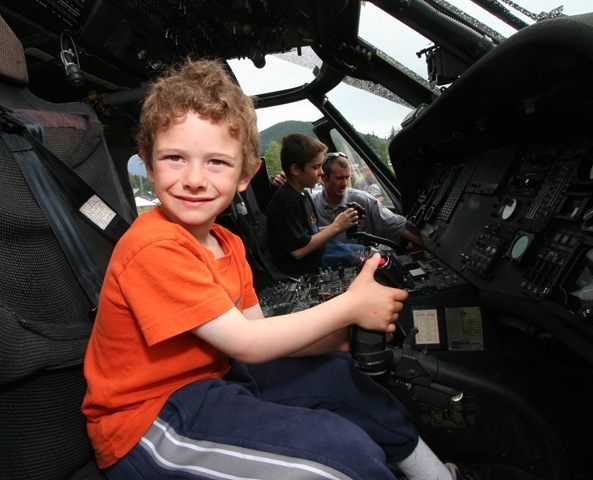 The black hawk airframe, the UH-60 is one of the wonders of modern aviation and comes in many variations: tactical transport of troops, electronic warfare, VIP transport, and aeromedical evacuation. We have a few of them in SE Alaska and one that comes into Haines quite often for medivacs. 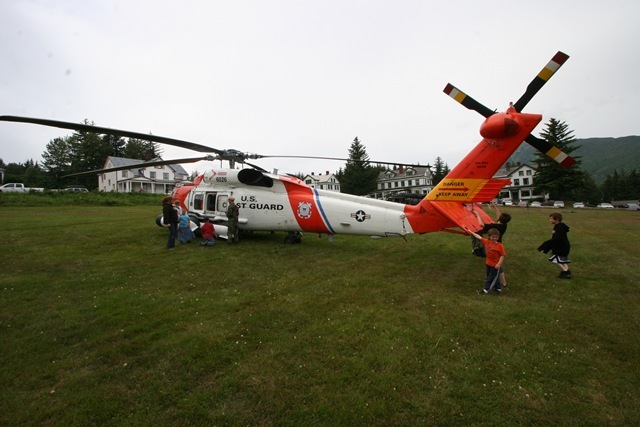 The coast guard runs them out of Sitka. Mark Daniel is in the orange shirt holding onto the hand-holds on the tail. I guess they have those there for maneuvering the helicopter while it’s in a hanger or on the tarmac, but I didn’t get to ask the crew. On Saturday, we had two of them on the parade grounds for the public to climb around inn. The military version that we had here today had both wheels and skids for landing pads and had all it’s guns removed. The coast guard version had two large fuel tanks on the left side, and no spots for gunners. I love helicopters, planes, tanks, air-craft carriers, humvees, and military things in general since the second author I got hooked on was Tom Clancy and his military books: Red Storm Rising, Hunt for Red October, and Cardinal of the Kremlin. I strongly recommend that military buffs read Red Storm Rising if they haven’t yet. It’s an amazing depiction of how a full scale cold war era third world war may have played out if it had ever come to that and it’s played out in multiple theaters simultaneously. In all honesty, I’ve never really talked about guns, tanks, airplanes, helicopters, ships, or anything else military or hunting related, except when he asks. My dad loves guns and has a collection, and my brothers have guns and get new ones from time to time. I do have a shotgun a “Home Defender” stainless gun, but I rarely shoot it and it has a trigger lock on it when it’s in the house. I think it’s best when Mark is young to develop a love for nature, so we read him books about animals wild-life almost all the time. There’ll be time later on to learn to shoot guns and hit targets and such. 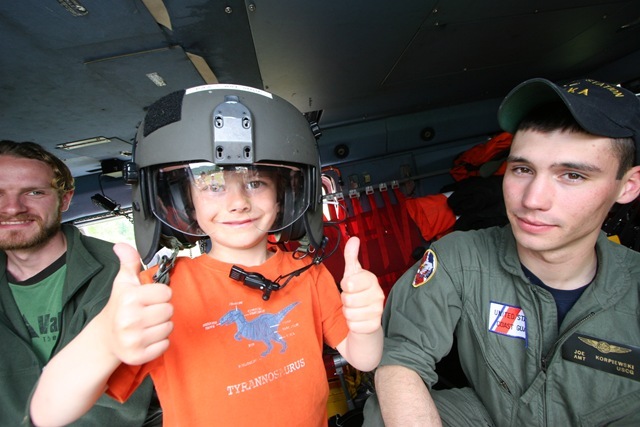 I did meet the photographer of the coastguard flight crew. He’s a canon guy who owns his own gear. 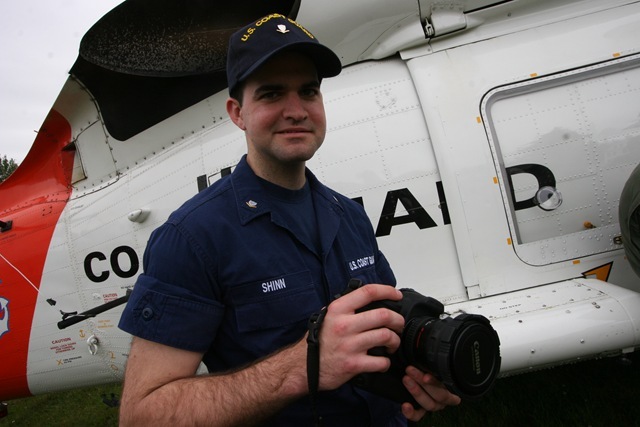 The coast guard owns Nikon gear, but he’d rather not use it so he buys his own. He had a rubber armored Canon 30D with the 17-40 f/4 mounted plus the battery grip. I do talk to the boys about photography quite a bit, as you might guess, and they love posing for photos whenever we go on special outings, as you can probably tell. Well, Mark is old enough for T-Ball now, and so we’re getting started on that. It’s a little bit stressful for him, because we didn’t really prepare him for it mentally, or physically. We didn’t even get him any books on the subject for us to read to him–which is the standard procedure. We did get him a glove last year at the Sports Shop, and the J6 crew got him some size 12T baseball cleats. On Monday, we told him we were going to start playing T-ball and we started working on throwing and catching, then on Wednesday we went to our first practice where he practiced some fielding and then some batting. 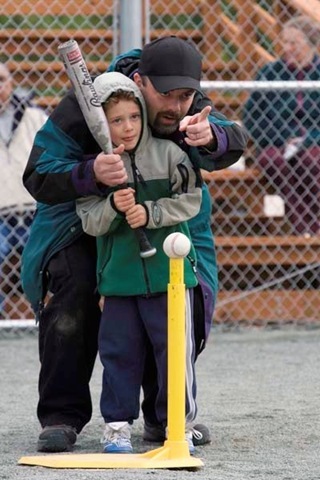 He was terrified of the batting, so that night we went and bought our own little practice T-Ball set so we could work on those skills. He liked the running to first base, but didn’t know where to find the base all the time and he definitely didn’t want to mess up and run to the wrong base. As soon as we got into the car after the first practice, we told him we had the first game on Saturday and he opened his mouth really wide and let out a big cry. He’d thought that T-ball was over and he wouldn’t have to do it again, then he found out we had a game on Saturday. It was tough for him. On Saturday, he cried the whole way to the ball field and Holly was not sure that T-ball was what we needed to be doing. I explained that he’s at just the right age to learn T-ball and that later on it’d be too late because his peer group would already know how to catch, throw, and bat by then. Photo by Steve Vick: CLICK HERE!! then click on T-ball for more of his pictures. When he got up to bat the first time, he just held the bat and descended into a puddle of tears, holding the bat and looking at all the fielders watching him. Parents in the crowd, were cheering him on, “Come on Marky, You can do it.” I went out there and picked him up and carried him back to the dug-out. We had a long talk about stress and doing what you’re supposed to, even when it’s scary. It was a tough talk. I talked about wrestling, and about teaching my first year. Then I told him, I’d go up there and be with him when he bats next time. I pointed over to it, and then he was fine. He hit the ball to third base, and made it to third, since they over threw first. They only played two innings, since each kid gets to bat each inning. When we got out to the car, Mark was all happy because he’d finished T-ball. Bummer. We had to explain to him that this was just the first of six weeks of Saturday morning games. When he hear that, his eyes teared up, he opened his mouth for a the mother of all breaths. Holly and I held our ears. Then he let loose again. Sometimes, that’s how it goes, I suppose. J6 came stopped in for a visit! My oldest brother Jack is married to Jennifer and they have four kids: John, Joy, Joanna, and Jessica. So they are known as the J6 family. Although I don’t think I actually ever say ‘family’ after I say J6. They weren’t always J6. For a while they were Jack and Jennifer, then they were J3, then J4… you get the idea. 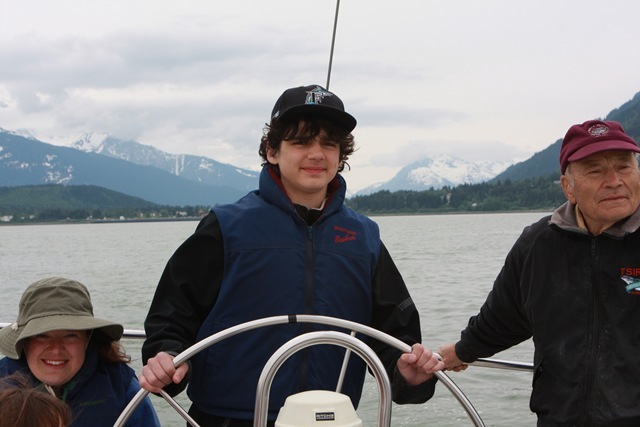 They rolled into town late Thursday night cheerful but tired in a caravan of three vehicles headed to Sitka so Jack can work at Edgecumbe this next year as the new Math/Science teacher. Inside their newly acquired big diesel 26′ moving van was virtually all their household goods driven by Jack. Next was the ‘Crayola’ (a toyota Corolla) packed with people and driven by Jennifer’s father, Chuck. Jennifer drove the Suburban. All three vehicles were packed to the gills. 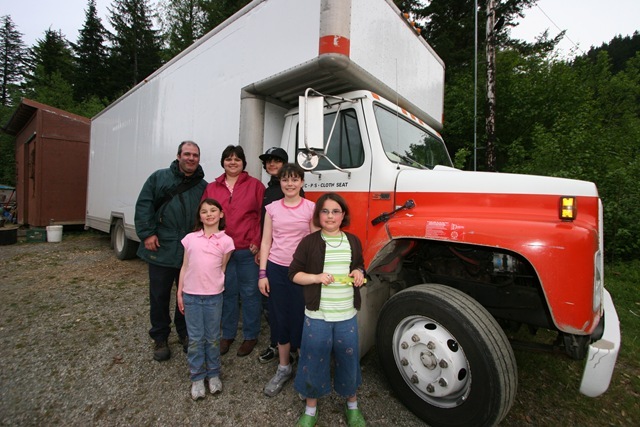 Since my driveway is fairly short, Jim Green and family offered to store the van at their place for the summer. This truck is the largest size that U-haul rents. The reason they were selling it is that it’s a diesel, it’s stick shift, and it’s so large. This type of moving van is usually rented primarily for cross country trips. 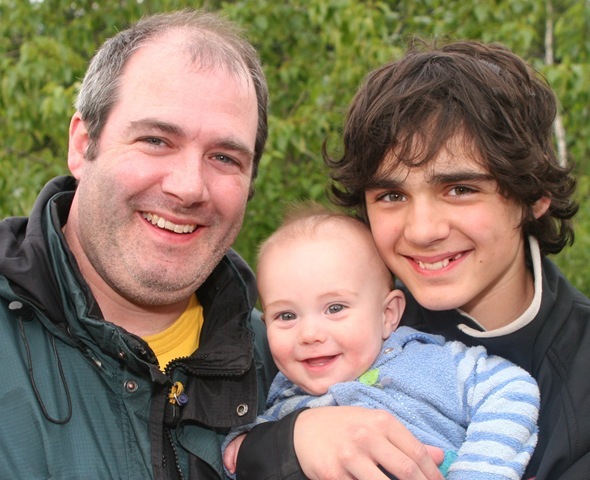 We have a surfeit of John’s in the family. Here are three of them. My brother Jack is John W. Davis Jr., then we have John Caleb (my third son), and then we have John Charles Davis (Jack’s oldest). John Charles and John Caleb actually share the same birthday: November 13, but they are not the same age (they both have charming smiles: it helps to have an infants mother behind the camera smiling and laughing.). Other folks named ‘John’ in the family are Holly’s brother John M. Plucker, my father John W. Davis Sr. and his mother Johnny Davis. We had a couple of action filled days. 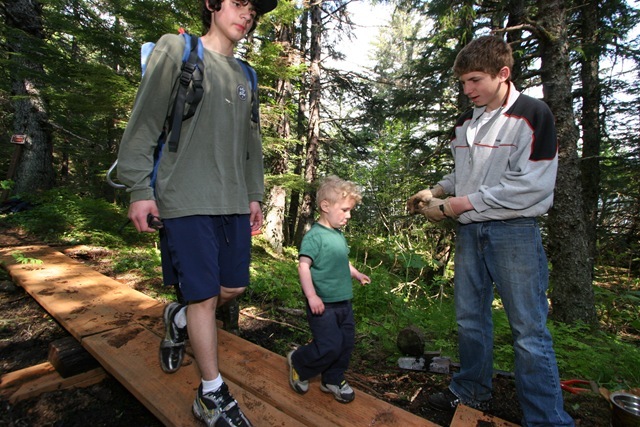 We went out to the beach at Battery Point where we met up with Hunter Badgley working on the trail with Paul Swift. John carried Luke in the backpack and had a personal best time out to the trail head. I forget what the time was, but they beat me by a fair margin. 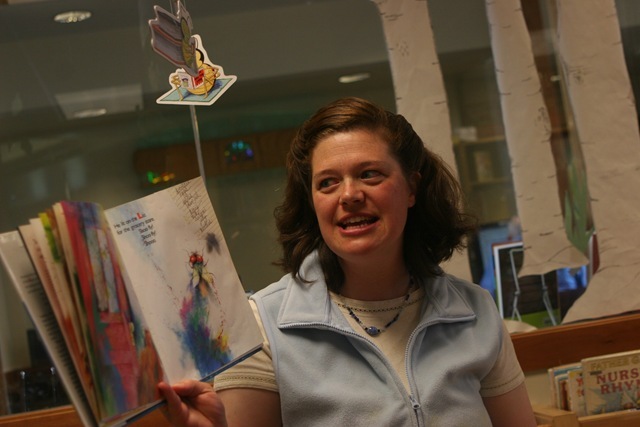 We all went to the story hour time and got to see Holly in action. Joy, Joanna, and Jessica all got involved reading books and collecting prizes, right off the bat and had a great time. I think Holly does a GREAT job with the summer reading program and I think I’m fairly objective too. While Joy and I went to the painting class, the rest of the family went to the swimming pool to get wet. And we also went out on a sailing trip with Bob and Margaret where everyone got to do a little bit of what they wanted to do: Jennifer got some sleep up in the V-berth, I got to shoot some more with Jack’s virtually new Canon 40D, John Charles got to man the wheel, Bob got to show off his boat, the kids got to play games and make up stories, and Holly and Margaret got to spend some time together talking about family. It was an interesting day for sailing, we didn’t really catch any wind until we got out pretty well clear of Portage Cove, whereas often we can catch a nice wind just three minutes out of the harbor. One thing my dad always does when I come to visit is fill up my gas tank when I leave town, so I told Jack I’d give him $90 for gas: but then I forgot to give him the money. Typical. So I’ll have to send a check down to the farm where my dad lives and he can cash the check there. Traveling is expensive these days. They left town on the ferry to Skagway at 10 PM on Saturday night, then drove all night and the next day. I just talked to them on their cell phone and they were just outside of Dawson Creek where they were going to stop for dinner (935 miles) then push on to Grand Prarie. That’s quite along haul for a days driving with four kids. It sure is great to visit with family and let the cousins play with each other. Every now and then I come across a book that is almost to realistic to continue reading. Seth Kantner knows what he’s talking about when he writes about the arctic. I finished ‘Ordinary Wolves’ two nights ago and have to say it’s a wonderful books. It’ll definitely make my top ten list for the year, come Christmas letter time again. I look forward to reading Seth Kantner’s next book, and wish him the best in terms of getting it done and enjoying life up in Kotzebue, which is, I believe, where he lives now. Luke and Mark say they’re hungry right now, so I better go and get them some food. Lately, I’ve been reading Seth Kantner’s book, “Ordinary Wolves.” It’s about a boy named Kataq that grows up in the arctic in a sod hut near a tiny remote (non-regional hub) village and how he struggles to find his place between the modern world and the old ways of the arctic. I strongly recommend the book to anyone from the bush, or to anyone that has family that spent any serious time up there. It really takes me back, not to my youth, because I was raised in BIA built housing and had flush toilets and running water in the same types of school housing which was built all over rural Alaska: Kotzebue, Savoonga, and such, but to back to the mind-set of the bush, and the way of speaking up there. What gives the book such verisimilitude is the dialog which is constantly riddled with Inupiaq words and has its grammar written in the once familiar way I grew up speaking. Most of the text is written in a fairly literary style which is hard to get through, for the most pat, but the dialog seems so real I just keep on reading. Getting emails from old classmates in Barrow is fun and interesting too. It’s interesting to try to imagine how we are living these days. I live in a little cabin with my wife and two young boys. Holly is from the Seattle Area and went to college back east in a private elite women’s college, I think it’s spelled Bryn Mawr College. I keep trying to figure out how I could possibly head up there for the 20th HS reunion to see everyone. With gillnetting the way it is, I just don’t see how I can take time off.